A luxurious range of towels that compliments the bed linen ranges. 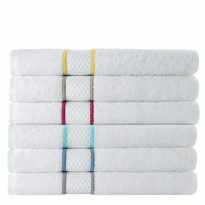 Yves Delorme is very popular for use as a deck towel because of it long size and variety of colours with embroidery. Towels can be custom embroidered by our in-house embroidery studio with the name or logo of the yacht. Exquisitely woven towels in plain colours and designs. 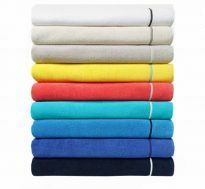 From super soft Cotton modal Etoile towels to deck/beach towels. A range for every bathroom and outside space.